This might be interesting to you. I certainly find it interesting. The numbers converge on the golden ratio (phi) ; oscillating either side of that number. Apparently, the sequence (of rationals converging on an irrational) has a special property (which I've forgotten for the moment) which means that a plant (such as a sunflower), growing a seed head from the centre, and with angular separation atan(phi), will be least likely to form cleavage planes which might cause the seed head to fall apart. So nature discovered the property first! Perhaps the most interesting thing that I ever saw was the Monty Hall problem. Not only does it have mind boggling probability, EM, the worlds highest IQ, tons of differing opinions, it has one more thing...goats! Yes, math ain't nothing without a couple of stinky goats thrown in. The most amazing things about it, were all personal. I became further convinced that EM was the only way to go if one desired to get the right answer an infuriating amount of times. Also, we were 2 of only 4 people in the world who knew that those Stanford and Duke university guys were not arguing with Marilyn. That would have been difficult enough, they were arguing with their own methods and colleagues who had hashed this problem to death in a statistics journal, many years before. RIPOSTP. The most interesting thing I have found in maths till now is the amazing relationship between Fibbonacci Series, The Golden Ratio and Nature. It has really amazed me. I also find pascal's triangle very interesting. There are 7 things that leaves me awestruck about pascal's triangle. This is one of the 7 things of the pascals triangle which i find very interesting. What are the other 6? Actually there are 13. They all are listed below in brief. 1. A number of the nth row and nth position getting found out by Combiantion. 2.Existence of Fibonacci Sequence as bob showed above. 3.Shading Odd nos. in a Pascal's Triangle gives Sierpenski triangle series. 4.HCF of any row of a prime no. excluding 1 is that prime no. itself. 5.If you draw a hockey stick starting from an extreme end (that is a 1)and make a Hockey Stick,with only 1 number in the "J", the sum of all nos. in the stick = to the no. in the "J" of the hockey. 11.Pick any number inside Pascal’s triangle and look at the six numbers around it (that form alternating petals in the flowers drawn above). If you multiply the numbers in every second petal, you’ll end up with the same answer no matter which of the petals you start from. 12.Pick any counting number from along the first diagonal and square it. Then look at its two neighbours that lie deeper inside the triangle – they’ll always add up to that very same square number. 13.If you add up every single number in the first n rows, you’ll get the nth Mersenne number. As I discovered, you can also modify Pascal's Triangle to help to construct the positive integer power sum formulas (image, video series) and the Bernoulli Numbers. 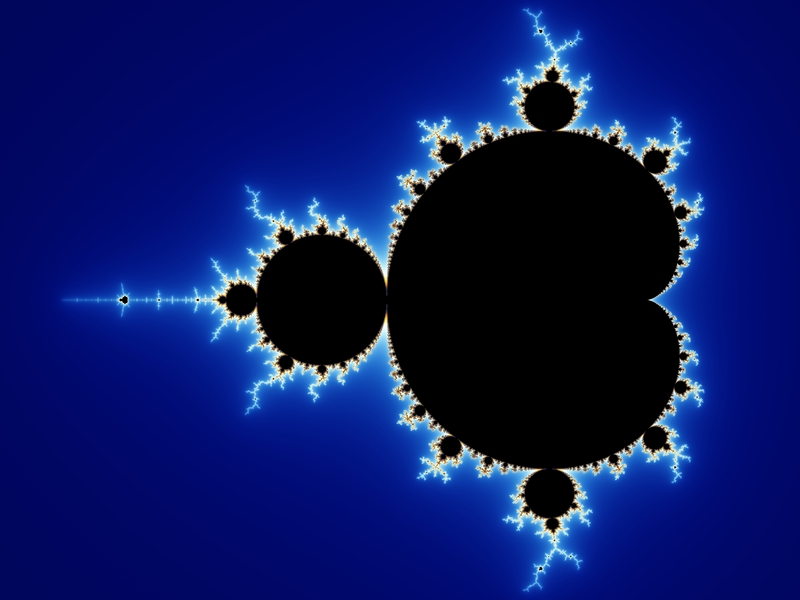 Mandelbrot's set is one of the most known fractals out there. The set contains all complex numbers, which if infinitely raised to power of 2 and added the initial value to, don't blow up to infinity but converge to a value. You can also create another fractal, or halo, around the set if you plot the last breakpoint value. If you think that every function transforms 2D plane's every point, the act of complex exponentation will bend the straight lines invards infinitely. 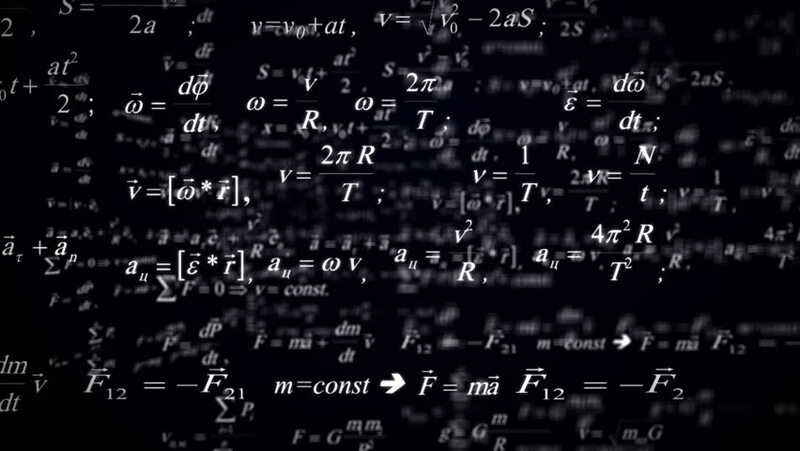 With negative values the numbers close to zero explode close to infinity and wise versa. just to name a few. With some of these the halos are more incredible than the actual set. A square has many symmetries. It stays same if you turn it 90 degrees, 180 degrees, to other direction of -90 degrees, rotate it from corner to corner and so on. Cube has even more symmetries. Hypercube has oh so many... and the number of symmetries rise exponentially. But mathamaticans have calculated that if you have some 200 000 -dimensional shape (just a big number idk), it doesen't follow the regular symmetry logic so far. It form's its own group of symmetry, sometimes referred as monster group, and is not the only instance when it happens. It is really hard to think what is really going on there, but John Convay himself thinks (somewhere in lines of) these obejcts like a christmas tree decorations; like this some regular shape, with some faces some going that way, some horizontally, some verticlaly, some in high-dimensional directions, but also unexpectelly in THIS direction. I have a piece of paper that has good exponentiation equations to memorize. This is what is written on it at the time of this post (edited ones have an underline). gets multiplied by itself one time. What did you mean here? is that I messed up; it shouldn't be (a^m)na, it should be (a^m)n^a. I feel so stupid for not checking with a calculator. DANG IT! I forgot to move the variables around! And I forgot to confirm it with a calculator or my miiiiind. Because I find that really beautiful, but then I realised that this was still just a conjecture.